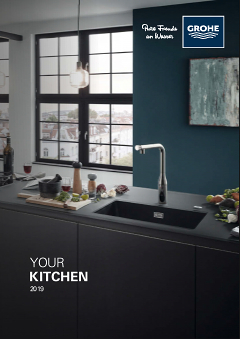 This GROHE Eurosmart kitchen tap offers the usability you need to tackle everyday kitchen tasks. You get more range to work in thanks to the 140° swivel action, but you don't have to worry about the spout bumping adjacent cupboards or walls. GROHE SilkMove technology lets you vary water temperature and flow effortlessly. This sink mixer also has the GROHE SilkMove ES technology built in, so that at mid-lever position only cold water comes out meaning you conserve energy. The Easy Exchange Mousseur system means that when it comes time to clean or replace the aerator you simply unscrew it with a coin. Presented in dazzling GROHE StarLight chrome, it is effortless to maintain, and the separate internal waterways mean you will enjoy pure, clean drinking water. Intelligent technologies for modern homes: with the GROHE SilkMove ES technology, only cold water flows in mid-lever position, allowing you to save energy when washing your hands or filling pots, and thus conserving the environment and cutting your utility bill. Warm water will flow as usual as you move the lever to the left, smoothly and precisely. For maintenance or replacement, the aerator is easy to unscrew with a coin, requiring no special tools. Whenever the aerator needs to be cleaned or replaced, it can be unscrewed effortlessly in a matter of seconds.